Flying with Jerrie Mock in 1964 - - Page 1. 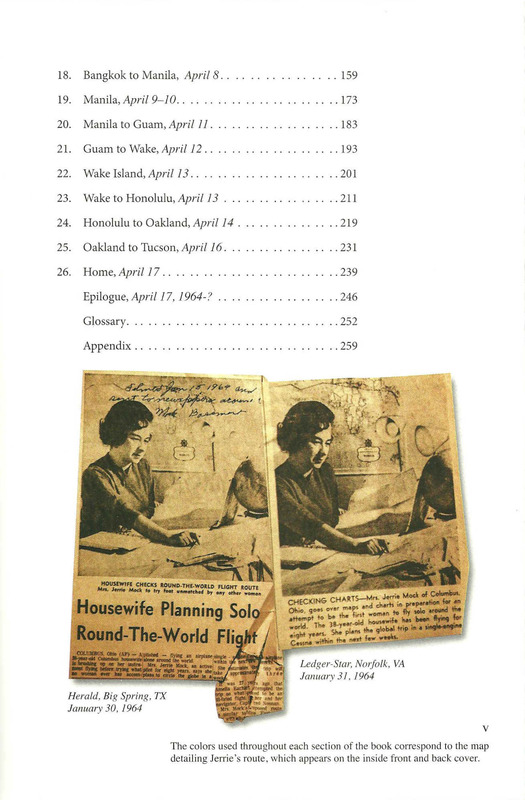 Flying with Jerrie Mock in 1964 · · PAGE 1. 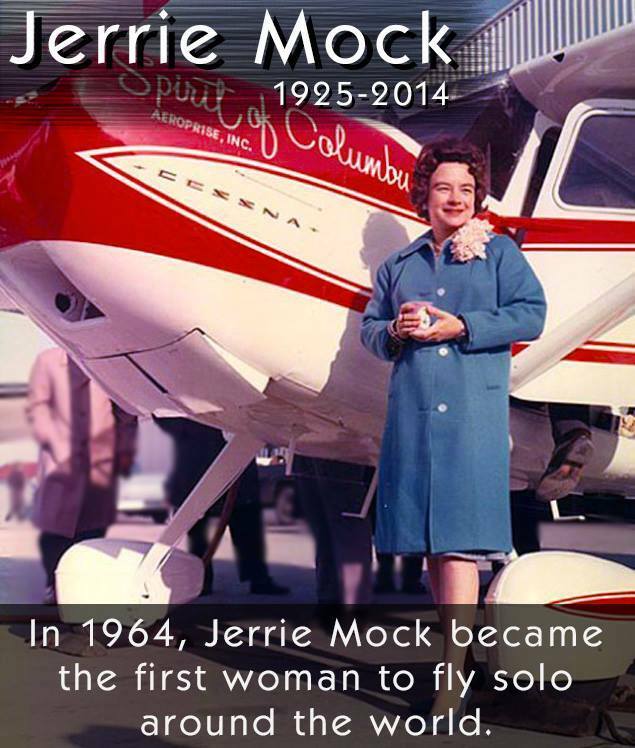 January 25, 2015: I first learned about Jerrie Mock when she passed away in the fall of 2014 at age 88. In 1964, Geraldine "Jerrie" Mock was a 38-year old "Flying House Wife" from Ohio who also had a career in aviation as a flight instructor and airport manager. She flew her 11-year old Cessna 180 around the world in just 29 days in the spring of 1964. She also set a number of other flight records after the around-the-world flight. I commented to my wife about this lady when I first heard about her in EAA and AOPA emails I received at the time of her death. She had written a book in 1970 about her record-setting flight. The book was reprinted in 2013 in time for the 50-year anniversary of her flight in 2014. I read that book last week and by the time I was finished, I felt I had shared the flight with her. I am creating these web pages to share that experience with all of you who visit here. The collectible 273-page hard cover book I received for Christmas was difficult to put down once I began reading it last weekend. 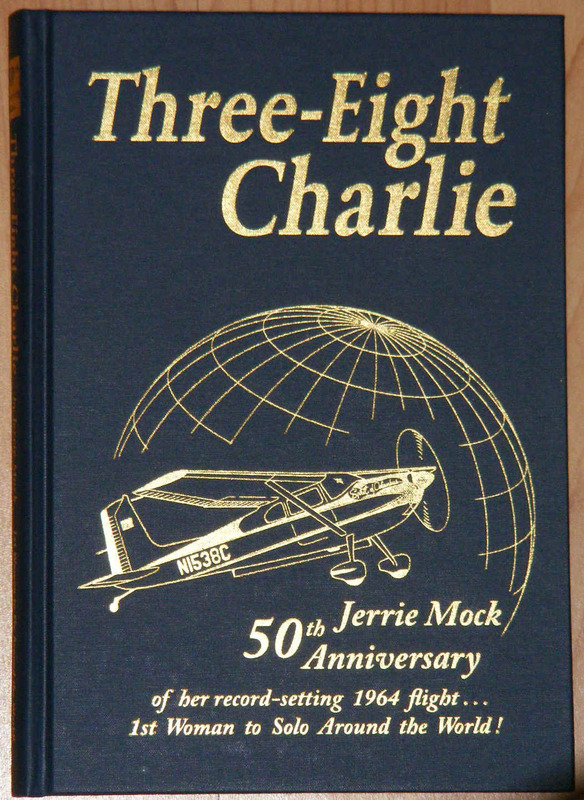 My book is number 933 from a numbered collection of 1,000 books printed for the 50th anniversary of Jerrie's flight. Phoenix Graphix published this excellent book. I want to use this web space to let everyone know where they can get a copy to share Jerrie's world flight as I did. It is also available in a paper-back version. As a pilot who has flown some long distances over the USA, I could relate to her experience out over the ocean. When you are on autopilot and in cruising mode, a pilot does all the things she described so well in her book. For a flight like hers, fuel management to keep the airplane properly balanced and stable is very important. I learned to fly in old Cessna 172, 150, and 152 airplanes with similar avionics equipment she used in her trip, but without the long range High Frequency (HF) radio she used for ocean flying. Modern GPS systems have removed the worry of missing your destination. The GPS 296 I use prompts with a profile for descending as you approach your destination. The professional methods she used to navigate using visual flight rules (VFR) and her understanding of weather when she used instrument flight rules (IFR) were things all pilots need to learn for long distance operations, especially over water. She visited many embassies in Washington, DC to obtain visas while preparing for the journey. This included landing rights at the proposed stops, and over-flight permission for Burma and South Viet Nam. 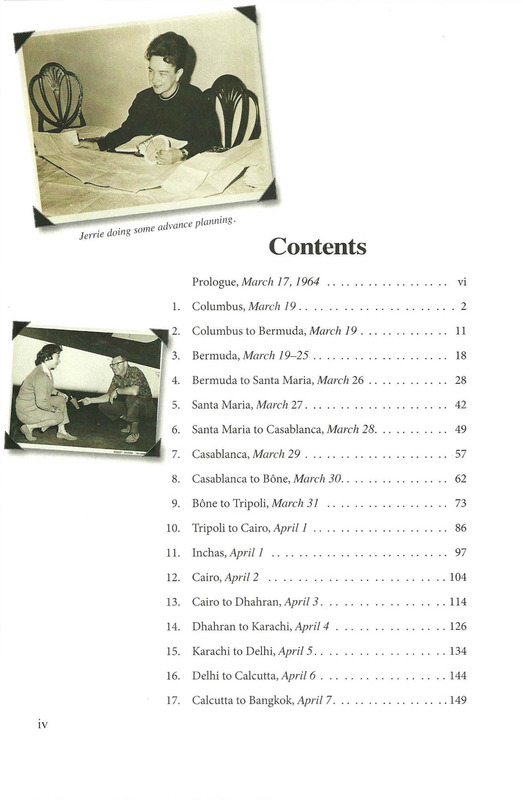 The copy of her logbook shows the entries beginning when she brought the airplane from Wichita where it received the final modifications for the trip with the installation of large internal fuel tanks. She received a special ferry permit to fly the airplane when it is full of fuel and over the rated gross weight. She departed Wichita at 9 PM on March 17, 1964 on a "short" flight of 791 miles to Columbus, Ohio. She had the following day to rest before beginning her epic adventure traveling around the world that began on March 19, 1964. The inside of the front cover of the hard cover book has this map of the major land masses of both hemispheres and the route of flight to each stop along the way. 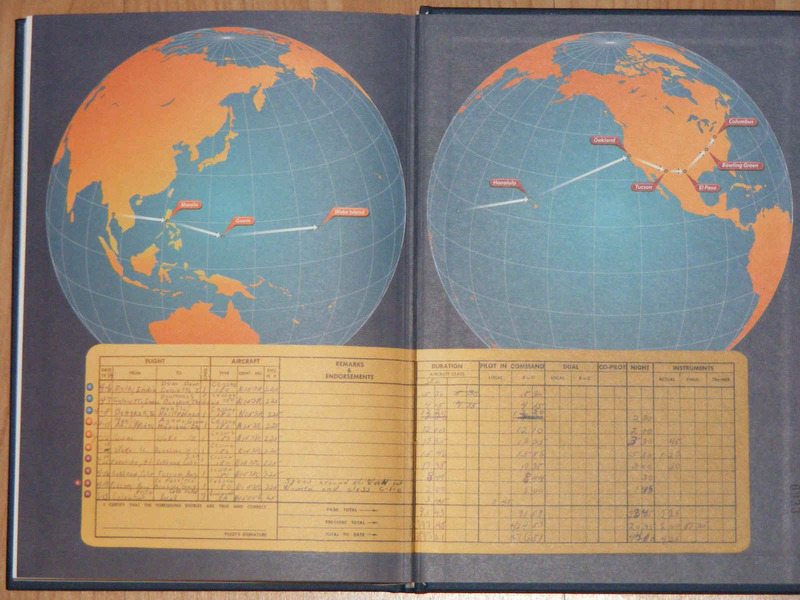 The inside back cover is similar, showing the flight across the Pacific Ocean and the USA stops from California to Ohio. 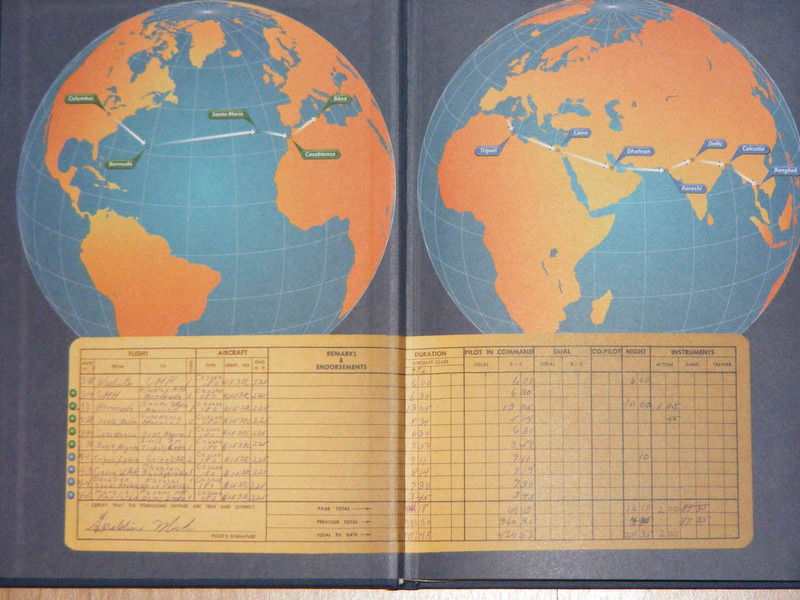 These world maps and log book entries are not a part of the paper back versions of this book. All the inside pages in the book are the same in both versions, but the pages with maps and old newspaper clippings in the paper back version are NOT printed in color. ONLY the outside of the paper back version is printed in color as seen here. Each chapter describes a leg of the flight with all the pertinent information all of us pilots notice as we watch the changing landscape below. Jerrie also put in her thoughts as she was cruising along just looking at the ever-changing view below. I set out on my journey with her, using her words and my imagination. This section of my web site is the result of my journey of imagination with her. I also used my GPS 296 and created the routes she flew to measure the actual miles for the trip. The route of flight and all her stops are depicted inside the front and back covers of the hard cover book. With each chapter, I added her waypoints to my GPS routes, including the off shore route she flew across north Africa and the waypoints in Asia. I took her verbal cues and tried to create an accurate flight path, allowing my GPS to measure the STATUTE miles flown. I recorded all my findings in a spread sheet and found some errors in her log book pages. The folks at Phoenix Graphix also discovered the errors in her log book. The normal fuel tanks for the 1953 Cessna 180 carried 60 gallons of 80-octane AVGAS. The ferry tank used for the round-the-world flight added 173 gallons for a total of 233 gallons for the longest flights. The empty weight of the airplane from the factory is 1,520 pounds. The back seats and the co-pilot seat were removed to accommodate the two large fuel tanks that were installed inside the cabin. The weight of the 233 gallons of fuel is 1,398 pounds. Consider the weight of the empty fuel tanks, electric fuel pumps that transfer fuel to the normal fuel tanks in the wings, plus the extra weight of the new radios and Jerrie herself. The airplane could have a fully-loaded take-off weight somewhere in the range of 3,300 pounds or more. Her flight from Honolulu, Hawaii to Oakland, California took 17 hours 38 minutes with about 50 gallons of fuel remaining. It is the longest flight over water for around-the-world flights. I used SkyVector to follow her route of flight using their online VFR charts for the whole world. I also used Google Earth to see what some of those places look like today. It made her trip seem that much better than just my imagination and her photos in the book. JUNE 14, 2015 UPDATE: My creation of GPS files for her flights is giving a new experience of flying the route with Jerrie using Google Earth tour animations simulating takeoff, cruise flight, and landings wherever she went on that 1964 trip. 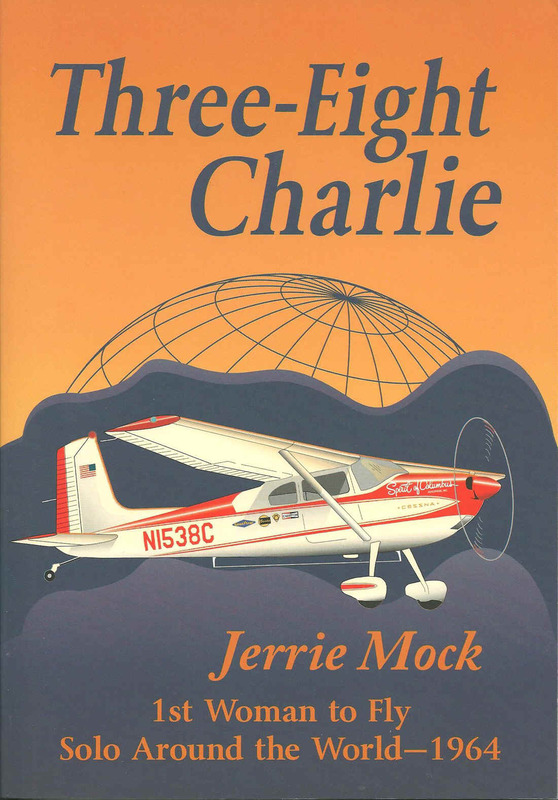 Do a Google search for Jerrie Mock and you will find plenty of information about her, including a Facebook page named "Fly38Charlie" with a lot of related postings about her book and plenty of photos. http://airandspace.si.edu/collections/artifact.cfm?object=nasm_A19760976000 This next photo shows Charlie sitting on the main floor before being lifted to the permanent location above the floor as seen in the next photo below this one. The photo below at NASM Dulles is from the Rod Beardon web site. That web link will allow you to see all of his aircraft photos posted online. Putting this link on my site allows me to use the photo here for non-commercial use. The top of the rear ferry tank is visible inside the airplane. I have seen how the Smithsonian restores these airplanes to the condition they were used when they make history. In this case, 38 Charlie got a new paint job and the large fuel tank in the weeks before the one-month mission began in March 1964. 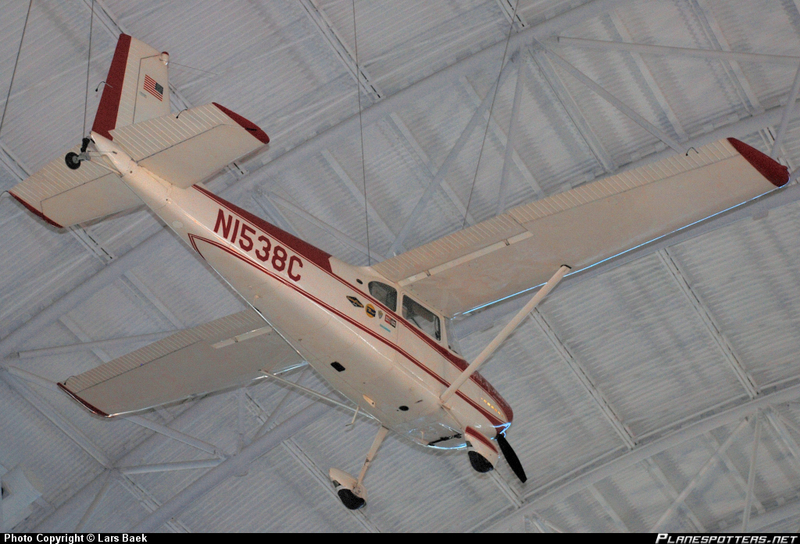 It hung inside the Cessna factory where it was built for several years before it went to the Air & Space Museum. The drag cone for the long-wire antenna is not installed in the original location now that Charlie hangs in the museum. You will see that retractable antenna in a couple of photos taken before her departure from Columbus, Ohio. It was on the bottom part of the fuselage in two photos I have on the next web page. This look at the underside of the airplane shows where someone patched over the original location of the long-wire H.F. antenna exit position from the fuselage. The WHITE circle just behind the RED stripes on the bottom of the fuselage marks the original exit location of the long-wire H.F. antenna and "wind sock" drag cone. It is now shown hanging down just above the tail wheel in this photo from the Plane Spotters web site. Although Jerrie did not mention it in her book, I feel the new location of the long-wire antenna was a result of the repairs she had done in Manila. The other thing to see in this photo is the small black rectangular antenna on the bottom below the rear window of the cabin. Inside it are two phase coil antennas that work with the thin wire antenna, both of which are connected to ONE of the TWO ADF receivers. A second pair of antennas are on the top side of the airplane. You can see them in the photo of the airplane before her takeoff from Manila when we get there later in these pages. The Smithsonian reported her total flight distance as 23,103 miles. This is apparently the direct distances for all the places she stopped on her trip. I added some suitable waypoints from Google Earth and the ultimate flight path I have computed using my GPS was 23,782 miles. This includes the diversion around the south side of Cambodia on the flight from Bangkok to Manila. When I was reading the chapter about North Africa, she diverted around bad weather and flew along the Mediterranean coast line. If you follow the shore line using Google Earth, zoom in until the "eye alt" is about 2,500 feet. That represents what you would see if you were flying along at 2,500 feet above mean sea level. 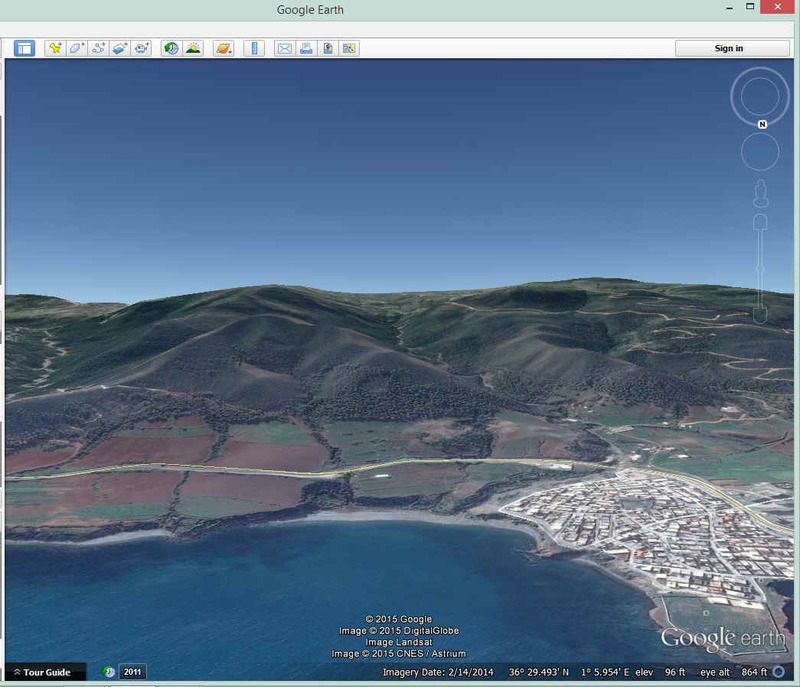 This screen capture from Google Earth shows a low mountain peak more than 1000 feet high less than half a mile from the Mediterranean shore. 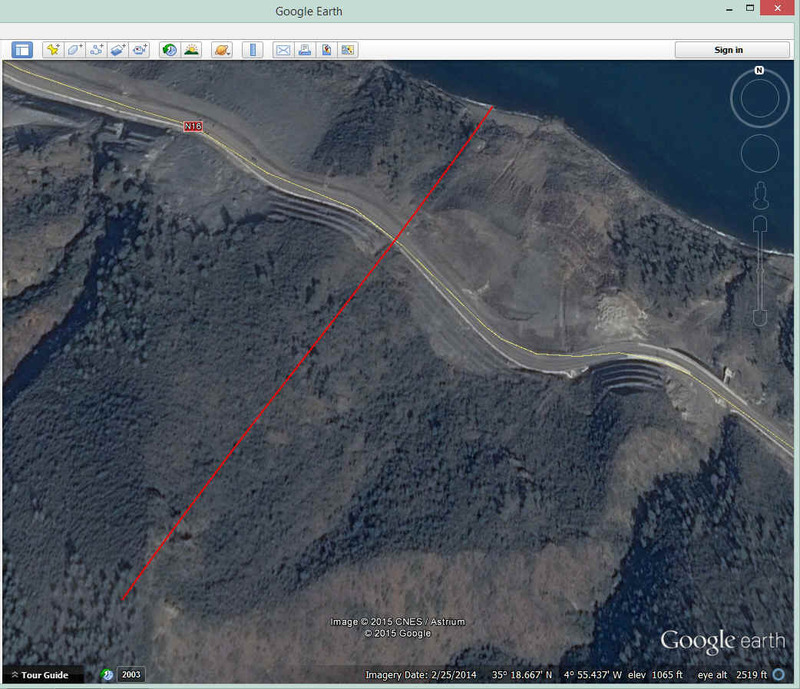 I drew that red line using the Google Earth measure tool set up to show miles as the unit of measurement. I placed my mouse at the end of the line near the lower left corner of the photo. The readout at the bottom right changes with the mouse location, showing latitude, longitude, and elevation under the mouse pointer. The "Eye Altitude" readout will vary as you zoom in or zoom out on the aerial photos that make up the views of Google Earth. All the photos for Google Earth were chosen to be free of clouds if possible. Sidi Abderranman is the town in Algeria seen here from Google Earth. 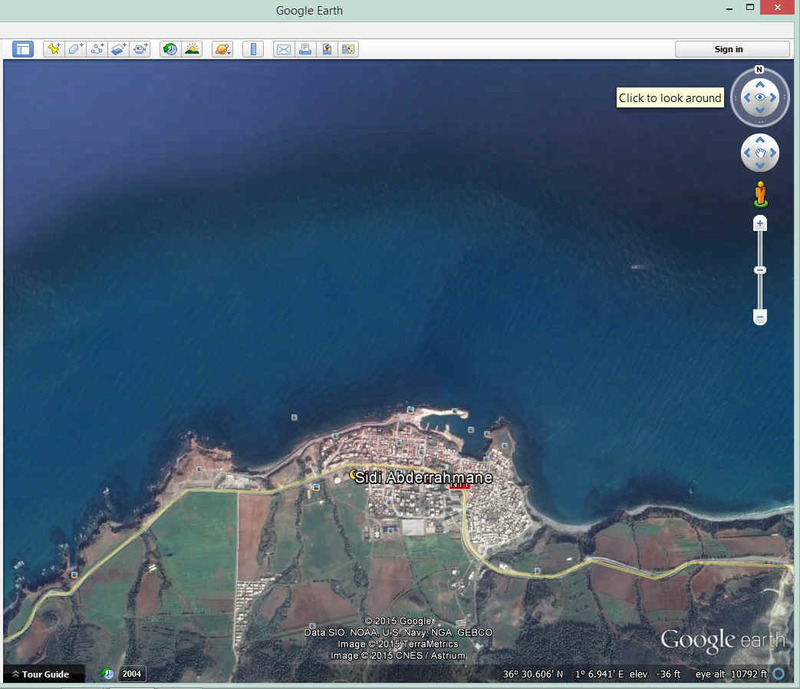 This is a screen capture anyone can do by looking down on any location you want to see. First, you zoom in or out until you get to the desired "eye altitude" you want as if you were flying across the terrain below. The eye altitude must exceed the ground elevation. In the example below, I set "eye alt" to about 1000 feet before doing the steps discussed below. Since the view here is from OFF SHORE, I wanted to show how much higher the mountain was above Jerrie's altitude as she flew past this location. Now, imagine you are flying with Jerrie Mock and looking out the right side of the airplane and you see this shore line and the mountains beyond to the south. The only thing missing is the weather. To get the snapshot I created above, you must put your mouse pointer on the "arrows" inside the circle with N at the top which always points NORTH as you push the arrows on the left or right side of the circle. These arrows and circles only become visible when you "mouse over" their location in the upper right corner of the Google Earth view screen. You can also just drag and drop the N anywhere around the circle and the image will rotate with it. Put the N at the bottom of that circle to look SOUTH toward the land. Then move the mouse to the pointer at the top of that upper circle and click it. It will raise "your camera" angle from the default position of looking straight down. When you get the horizon about half way into your screen, you are now simulating the view as seen from an airplane flying at "eye alt". You can then see a picture similar to the one I captured and posted above. You can do this anywhere on the Earth. Clicking on the four arrows in the second circle seen in the image below moves the location of your view point up, down, left, and right on the screen showing different locations on the map of the Earth. Raise your view point (eye altitude) to over 200 miles and it appears as if you are orbiting the planet. I will be adding more Google Earth images like these in the coming weeks to show more of Jerrie's flight views in places where there may not be any major changes since 1964 when she made her flight around the world. I find these views to be helpful where there are no photos from her collection. When you want to "fly" over the landscape, do not use the ZOOM slider bar or the mouse wheel. It will change the "eye altitude" if you do that. The smart thing to do is to get to the desired eye altitude, then set the "camera angle" to show some sky above the horizon. This allows you to see more of the ground or water closer to "your airplane". To move over the landscape without changing eye altitude, move your mouse UP on the screen, "moving the pointer" in the direction you want to move and be sure to stay below the horizon. The next thing to do is a "DRAG AND DROP" with your mouse to PULL the land toward your view point. Watch the readout in the bottom right corner of the screen to verify that your eye altitude remains constant. Use the letter N in the upper circle as your compass as you "fly" over the landscape on the screen. The book title page shows Jerrie and the airplane on the ramp at Wake Island in the Pacific Ocean. She is wearing slacks and a blouse here since there are not any news photographers on Wake Island. She never flew Charlie again after her return home. 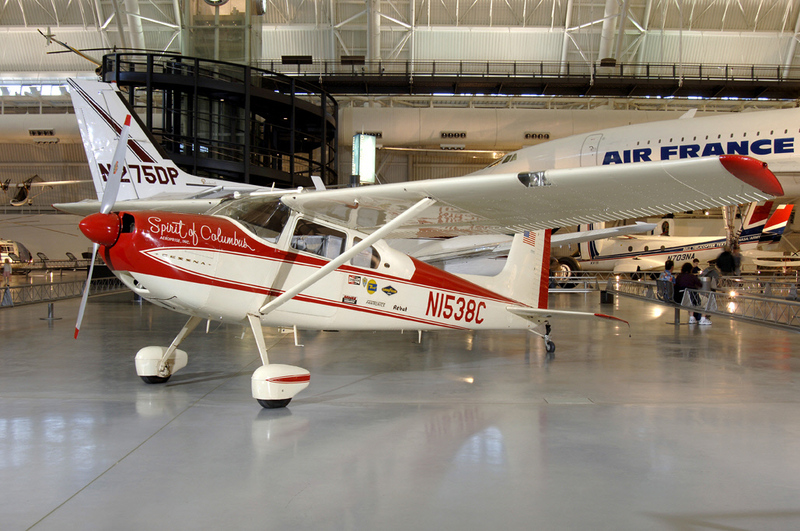 Cessna provided a new Stationair 206 and kept "38 Charlie" hanging in their factory in Wichita for a number of years. That photo is on the Facebook page about this record-setting flight. There are a couple of photos to see on this page. The first one is Jerrie at home planning her flight. That round device in her hand is a circular slide rule customized for aviators. The second photo shows her airplane with the long wire antenna after it was installed in Florida. That photo also shows the airplane before it was re-painted with its famous red and white "Spirit of Columbus" design in Wichita, Kansas in the weeks just before the flight around the world. The man in the photo is pointing to a black leather "wind sock" that pulls out the actual wire antenna behind the airplane in flight for long range communications. Jerrie mentioned the trip to Florida and taking a test flight off the East coast of Florida to test the short wave radio and communicate with Oceanic air traffic control. Here is the second contents page from the front of my collector's edition hard cover book. As we begin our virtual flight with Jerrie Mock, it does not matter if you, the reader, are a pilot or NOT. I have written these pages in plain language and explained the tools used by pilots in flight. Different types of radio navigation transmitters and receivers are described in simple terms. Photos are provided to show some of the examples of these things. Each time you visit the Jerrie Mock pages, be sure to clear out temporary internet files from your browser before you open the browser to begin the adventure again. I will be making changes to these pages as I discover new photos to be added. The route will get more Google Earth images as I update these pages on my web site. There is more content to come, stay tuned. I hope you enjoy this flight around the world with Jerrie Mock in 1964.